Bathing should always be one of the more simpler activities of the day, but our company recognizes that for many people, like the elderly or disabled, it isn’t so simple. According to American Psychological Association’s review of a 2016 Pew report, more than 12 million people ages 65 and older live alone in the United States. More than 60% of older adults say they would rather age in their own home, with assistance if needed. Regardless of the situation, no one should to depend on others if there are independent options available. A 2013 study from the National Center for Biotechnology Information showed that the most common place for people 65 and up to suffer a fall is in the bathroom. There’s no shame in needing help from others, but having to rely on someone can also become quite tiresome. Home Healthsmith™wants to help keep the experience of not just taking a shower or bath, but doing anything bathroom-related, as easy as possible. It doesn’t get much more convenient than this. Our Shower Bay is essentially a mobile shower, designed especially for wheelchair users. It’s a product that can come in handy should your own shower not be wheelchair-accessible, but it also works if you’re looking for a shower than can fit right in your bedroom, or if the current bathroom requires stairs or is otherwise inconvenient. This product requires only four feet of width and length, and a little more than four feet of height, so it can fit right in that empty corner of your bedroom—as long as there’s a faucet within 35 feet. Longer connecting hoses are also available, allowing the Shower Bay to be installed pretty much anywhere. Shower doors ensure privacy, and to keep the water in. As long as they’re fully closed, water will then exit through the external hose, and then down the drain it’s attached to. The Shower Bay’s “snap-together’ model, makes it simple to put together and allows for it’s portability as well. Be aware the we can install it for you ourselves, as with any of our products, if needed. We also provide a plethora of accessories that might seem small compared to a mobile shower unit, but can help in big ways. Shower grab bars that don’t require wall studs are one of our specialities. All Home Healthsmith™grab bars that we install will pass all ADA guidelines and building codes. The Pressalit grab bar can fold against the wall both horizontally and vertically, allowing you to find your perfect grip. It is also detachable so you can take it out at will, but it does require blocking in order to be installed. No matter which model you choose, you won’t have to worry about the bar coming out of the wall. Our grab bars have their own sort of fastening-to-the-wall system—grab all you want, it’s not coming out. Shower seats can also be a big help for those who have trouble with mobility. Our standard chair with adjustable height is a good choice for those who like moving their position while in the shower. 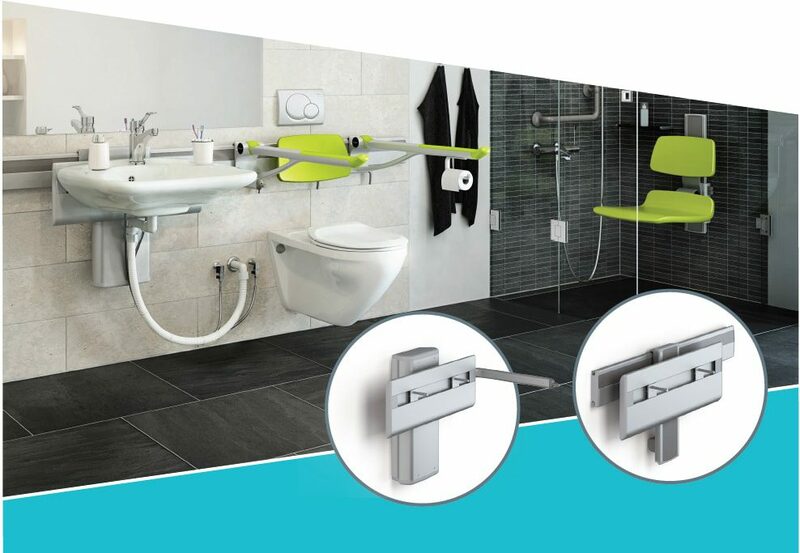 The Pressalit Plus shower seat has foldable armrests along with powered adjustable height, making it easy to find just the right fit, while greatly enhancing safety and the prevention of a slip or fall. In addition to shower and bathing accessories, Home Healthsmith also sells and installs a variety of modified toilet seats. The TILT toilet incline lift is unlike any other toilet accessory you’ve seen before. It’s an inclined seat that has non-slip covers, and is compatible with most style bowls. The seat also supports up to 325 pounds, and comes with a two-year warranty. These products can make your bathroom life easier. Visit Home Healthsmith™ to see which products best fit your needs. Call us at 401-293-0415, to schedule an appointment at our location of Portsmouth, Rhode Island, or click here now to contact us via email.